It was a rare evening yesterday when no huge movie premiered on a Wednesday. There were actually few movies started to premiere but nothing that really caught my attention. And since I was supposed to have a meeting which would last till late night, I did not really aim to see any film. But as it happened, the meeting was cancelled and I was able to leave the office at around 6PM, and with my wife having no plans for the night, we decided at the very last minute to watch this movie that started at 7.15PM (other movies premiered in far locations). Still, it was rather tight, but we were able to make it. What was the movie all about? Let's find out. Mae Holland (Emma Watson - Beauty and the Beast, Harry Potter series etc) was working for a small company as a customers relation. She was still living with her mother Bonnie (Glenne Headly - Dirty Rotten Scoundrels etc) and her father Vinnie who was having Multiple Sclerosis (played by the late Bill Paxton - Twister, Edge of Tomorrow and so on). Mae also had a close friend since childhood named Mercer (Ellar Coltrane) who was a very simple minded person and seemed to be having a history with her. Through a good friend of hers, Annie (Karen Gillan - Not Another Happy Ending and as Nebula in Guardians of the Galaxy) Mae was able to move work in a very famous large techno corporation called the Circle earning a much better pay which would help Mae taking care of her father. The Circle was co-founded by Eamon Bailey (Tom Hanks - Sleepless in Seattle, Forest Gump and many more) and Tom Stenton (Patton Oswald - The Secret Life of Walter Mitty, Agents of S.H.I.E.L.D TV series etc) and was famous for its popular apps and having a lot of users connected. In one of the weekly session, Eamon introduced all the employees about a new invention of very small camera that can be put anywhere which would enable the users to see everything through the eyes of these cameras and provide good solution from simple purpose of seeing the wave of the sea to more serious thing like counter terrorism. During a party hosted by the Circle, Mae met with a mysterious guy whom she seemed to take an interest on (played by John Boyega - Star Wars: The Force Awakens). Meanwhile Mae also started to be spending all her time in the office and its "dorm" and never even have the time to go back to her home. She would later on experience something that would change her views about the Circle. How would Mae cope up with the time allocation for herself and the Circle? Who was the mysterious guy Mae saw in the party? And what kind of experience that Mae would have? Find them all in this drama thriller movie. Well, it was a bit of interesting to see this movie. I was thinking that it would be a total thriller from beginning till end. However, it turned out that the movie was more drama than thriller. It was categorized as techno-thriller which I think was a term used to describe a movie where the thriller was more on technology side. Unfortunately, I found that the movie was not having a lot of thrill. There was no mystery that was very intriguing to find out. There was brief moment of suspense before the end, but that was it. The premise of the movie itself was actually very promising. We were put under the impression in the beginning that it would be a very interesting dark mysterious story, but till the very end, it was not that mysterious. I understand that the movie was adapted from a novel titled the same written by Dave Eggers. Based on the very brief synopsis of the novel, I think that the movie would have been better had it been honoring the storyline from the novel as it seemed to be more interesting (the novel itself was having better review than the movie). In term of the characters, I felt that Tom Hanks portrayal of a boss to this very large corporation was very good in the beginning, but not really good at the end. While Emma Watson fresh from her last blockbuster hit Beauty and the Beast was surprisingly good in hiding her British accent. This was also the last movie that Bill Paxton played in. His portrayal of a person having the illness was spot on and made us feel sorry for him. Another one that I think quite stood out was the characters of Annie and Mercer, while the rest did not really gave impressions. Anyway, I think the idea of the story was quite good and up to date and supposed to make us re-think about the privacy issue in social media. So it was rather sad to see the movie did not provide a real spark, apart from the brief part towards the end of it. I cannot say that I totally enjoyed the movie, but neither can I say it was a really bad movie. It was just average for me. If you are looking for some smart techno thriller movie with lots of suspense and thrills plus mysteries, then I think this movie did not really up to that level yet. 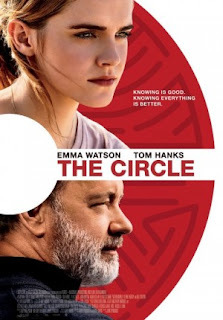 But if you want to see something different, or maybe want to see Tom Hanks & Emma Watson in the same screen together, I guess you could try and see this one. The choice is yours.